Early in 2003 Matt Mullenweg had just turned 19 when he faced a problem: the "logging software" of his blog, which already attracted a respectable 130 visitors a day, had been abandoned by its main developer. Convinced of the open source model, which - in his words - would enable others to continue should he fall off the face of the planet, he decided to create a fork and started a project which later he called WordPress. Rather than disappearing from the planet, Matt and WordPress quickly became a role model on how to build a successful business on the basis of an open source product. Matt received countless awards, such as making it into the list of The 25 Most Influential People on the Web. In 2007, aged 23, he reportedly turned down a $200 million acquisition offer for Automattic, the company behind WordPress. 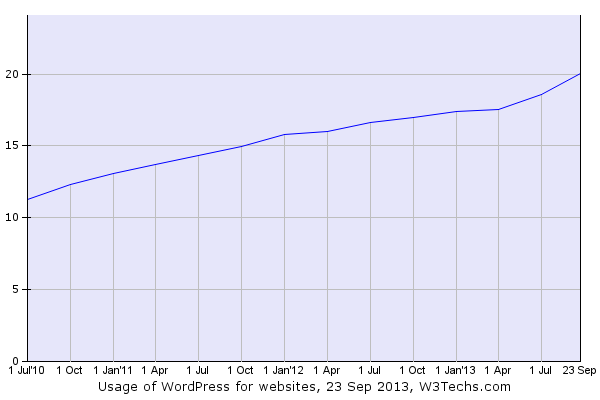 As of today, we can report another incredible milestone: 1 in 5 websites now are powered by WordPress. Compare those 20% of the web to the 18.8% that use .NET, or the 2.7% that run on Java. Compare this to the 19.5%, which is the sum of the 10 most popular country-code top level domains (Russia + Germany + UK + Japan + Brazil + China + Poland + India + France + Italy). WordPress is not only the most popular content management system, it is significantly more popular than all the other systems in our survey combined. And WordPress is still gaining users from all other major competitors. On an average day, more than 2000 of the top 10 million websites start using WordPress, which makes it also the fastest growing system. WordPress is a bit less dominant on high traffic sites, where its market share is slightly below 50%. With a usage rate of 30.4%, WordPress is particularly popular on English language sites, while it's only used by 7.8% of Chinese and by 3.6% of Korean language sites. One note on how we count sites: when people look at our statistics, they often say: "yes, WordPress looks so popular because of all the free blogs at WordPress.com". However, this is not the case. In all our surveys we do not count subdomains as separate sites. Therefore WordPress.com only counts as one site, no matter how many blogs they host as myblog.wordpress.com. Our survey also shows that 65.7% of all websites use none of the established content management systems. Plenty of room for WordPress to keep growing for a while, despite the fierce competition in that field. I have been using WordPress since 2006, and I absolutely love it. By far the easiest to use platform that you can hand over to a client without pulling your hair out. Great news! Although, it doesn't surprise me. WordPress has been my development platform of choice for years (no other CMS even comes close). Glad to hear its popularity continues to rise.